When I was in Moscow last year, I paid a visit to Boris Nemtsov, one of the leading figures of the Russian opposition. Naturally, I had come to Nemtsov to discuss Russian politics. But the conversation quickly turned to, of all things, Venezuelan economics. Ouch. Harsh words. But then again, Nemtsov has the numbers to prove it. Venezuela was the only country in South America to see its economy shrink last year. By many reports, it now suffers from the world’s highest inflation. In 2010, Venezuela was the only South American country to have a negative balance of foreign investment. (It dropped by $1.4 billion.) The International Labor Organization says that Venezuela was one of only five countries in the region to see job growth fall. (The others were Barbados, Jamaica, Honduras, and Trinidad and Tobago.) Power outages, rolling blackouts, and water shortages have become common as state infrastructure crumbles. And, in perhaps the most stunning achievement, the state-owned oil company has reported falling profits — even as oil prices rise. When I mentioned these and other signs of economic decline to members of Chavez’s political party last year, they scoffed. What I didn’t understand, they said, was that Venezuelans were some of the happiest people in the world. Okay, maybe. But I didn’t meet anyone happy about the shortages of basic staples like milk, sugar and meat. And I didn’t meet anyone happy about the fact that crime has reached epidemic levels. Experts estimate that there were more than 19,000 murders in 2009. It is hard to know the precise number because the government stopped publishing the figure after it began to soar. But fortunately all of this is about to end. Chavez just announced that he is raising the minimum wage by 25 percent. He is also going to end unemployment by creating 3 million jobs in the next eight years. And he will build 150,000 houses this year and another 200,000 in 2012. Of course, he has made these promises before. In 2005, he was going to build 120,000 houses. A government ministry later said 21,400 were built, less than 20 percent of the promised total. In fact, over the duration of Chavez’s time in office, the government builds an average of 12,500 homes a year. But Chavez will reach his goal. Because his real goal isn’t meeting housing targets he has failed to meet before. It is to inject enough short-term cash into people’s wallets to raise his chances for reelection in 2012. Never mind that that cash will disappear from their wallets as the minimum wage hikes fail to keep pace with inflation. Indeed, Chavez’s newly announced measures will make inflation worse. But he isn’t concerned with that. As he told a crowd this week, “I have a year and a half more in this government, then six more in the next one.” That is Chavez’s main consideration. Six more years. Because, whatever he does to Venezuela’s economy, the man is no idiot. Cuando estuve en Moscú el año pasado, hice una visita a Boris Nemtsov, una de las principales figuras de la oposición de Rusia. Naturalmente, yo había llegado a Nemtsov para discutir la política rusa. Sin embargo, la conversación rápidamente cambio, de todas las cosas, la economía venezolana. Ouch. Duras palabras. Pero, de nuevo, Nemtsov tiene los números para demostrarlo.Venezuela fue el único país en América del Sur que vió su economía disminuir el año pasado. Varios reportes de distintas fuentes indican, que ahora sufre la inflación más alta del mundo. En el 2010, Venezuela fue el único país de América del Sur tuvo saldo negativo en inversión extranjera (se redujo en $ 1.4 mil millones). La Organización Internacional del Trabajo dice que Venezuela fue uno de los cinco países de la región que vió caer el crecimiento del empleo (los otros fueron Barbados, Jamaica, Honduras y Trinidad y Tobago). Cortes de energía eléctrica, apagones y escasez de agua se han convertido en cosa comun ya que la infraestructura se desmorona. Y, tal vez el logro más impresionante, la empresa petrolera estatal ha informado de la caída de beneficios – aun cuando los precios del petróleo suben. Cuando le mencioné estos y otros signos de declive económico a los miembros del partido político de Chávez el año pasado, se burlaron. Lo que no entiendo, dijeron, era que los venezolanos son de las personas más felices del mundo. Bueno, tal vez. Pero no me encontré a nadie feliz sobre la escasez de alimentos básicos como la leche, el azúcar y la carne. Y no me encontré a nadie contento con el hecho de que la delincuencia ha alcanzado niveles epidémicos. Los expertos estiman que hubo más de 19.000 asesinatos en el 2009. Es difícil saber el número exacto porque el gobierno dejó de publicar la cifra después de que comenzara a elevarse. Pero, afortunadamente, todo esto está a punto de terminar. Chávez acaba de anunciar que el aumento del salario mínimo en un 25 por ciento. Él también va a acabar con el desempleo mediante la creación de 3 millones de empleos en los próximos ocho años. Y se construirá 150.000 casas este año y otros 200.000 en el 2012. Por supuesto, él ha hecho estas promesas antes. En el 2005, se iban a construir 120 mil casas. Un ministro del gobierno dijo más tarde se construyeron 21.400, menos del 20 por ciento del total prometido. De hecho, durante el gobierno de Chávez, el gobierno construyó un promedio de 12.500 casas al año. Sin embargo, Chávez llegará a su meta. Debido a que su objetivo real no es cumplir con las metas de vivienda que no ha cumplido antes. Es inyectar suficiente dinero en efectivo a corto plazo en los bolsillos de las personas para aumentar sus posibilidades de reelección en el 2012. No importa que ese dinero vaya a desaparecer de sus carteras como los aumentos salariales ya que no pueden seguir el ritmo de la inflación. En efecto, las medidas recientemente anunciadas por Chávez harán que la inflación empeore. Pero él no esta preocupado por eso. Como le dijo a una multitud de esta semana, “tengo un año y medio más en este gobierno, y luego, seis más en el próximo.” Esa es la preocupación principal de Chávez. Seis años más. Porque independientemente de lo que le haga a la economía de Venezuela, el hombre no es un idiota. The presidents of Venezuela and Ecuador are revealed as backers of the criminals who fight Colombia ‘s democracy. LAST SATURDAY, Colombia ‘s armed forces struck a bold blow against the Revolutionary Armed Forces of Colombia (FARC), a group specializing in drug trafficking, abductions and massacres of civilians that has been designated a terrorist organization by the United States and Europe . Raul Reyes, a top commander, and some 20 followers were killed in a bombing of their jungle camp in Ecuador , a mile or two from the Colombian border. The attack was comparable to those the United States has recently carried out against al-Qaeda in lawless areas of Pakistan, and it showed how Colombia’s democratic government may be finally gaining the upper hand over the murderous gangs that have tormented the country for decades. BUENOS AIRES, Aug. 9 — Days after authorities discovered a suitcase full of nearly $800,000 that had been taken on a private airplane carrying Argentine and Venezuelan officials, one of those officials has resigned and suspicions of a government scandal have grown. A Venezuelan businessman was detained at a Buenos Aires airport Saturday when customs officials found $790,550 in undeclared cash in his luggage. The incident preceded Monday’s arrival here of Venezuelan President Hugo Chávez, leading to questions about the possibility of a link between the businessman and the Venezuelan or Argentine governments. 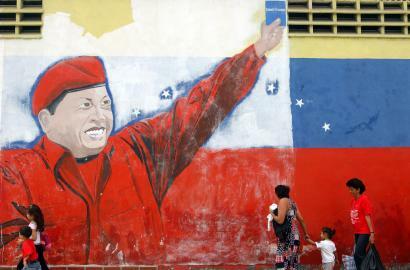 As increedible as this might appear, I still think there is some good in the politics Chavez do. As I have expressed before, the countries need to help each other, with the intention of stopping genocides, or helping the poor out of their misery, or to get rid of dictators (Fidel, Hugo, etc). Some of this efforts may not be recoverable in economics terms. However, they must be done. Without opportunity and justice for all, the world will never see peace. Chavez does what he does not for the good of the people – he would not do all other criminal acts if that was the case – but in this case, Morales seems to at least be giving away this money in a sort of less political tint way as Hugo does. Allama-wool hat swathing his head, Santos Paredes took the floor with photos in hand — images of a half-built medical clinic in his village on the high plains of the Andes. Paredes, the mayor, entreated Bolivia’s president, Evo Morales, for money to finish the job. “I ask for your blessing,” Paredes said, laying the pictures across a red-velvet tablecloth as the president leaned in for a look. Morales was here to distribute aid supplied by his ideological kinsman, Venezuelan President Hugo Chávez.